To offer more flexibility in choice of subjects to students and ensure minimum prescribed teaching days during a year, the Himachal Pradesh government has decided to switch over to semester system for the undergraduate courses from the ensuing academic session (2013-14). Instead of the existing annual system, there will be two semesters of six months each in an academic year and the courses will be split accordingly. The first batch under the semester programme will be admitted to the BA, BSc and BCom streams in June. The new system will be introduced only for the first year students and the second and third year students will pass out under the old system. 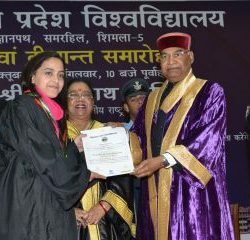 The students will be offered courses under choice-based credit system and the final examination will be conducted by Himachal Pradesh University at the end of every semester. The details have been worked for the implementation of the new system at a high-level meeting chaired by Chief Secretary Sudripta Roy and necessary directions have been issued to the university. The credit system for various courses will be on the pattern of Central University. The students will have more choice and flexibility in subjects they want to study and it will help bridge the prevailing divide between humanities and science apparent under the current system. The students will have greater choice of subjects within a maximum number of credit points. Under the new system, each semester will have 90 teaching days for which at least four-and-a-half months of teaching will be required. The semester examinations will be held in November and April. While the students will be free to undertake optional subjects across the streams, they will have to obtain the minimum prescribed credit in core subjects which will account for 80 per cent of the total credits. A science student could opt for a subject like music, psychology or economics under optional subjects. However, much will depend on the availability of faculty in the colleges.